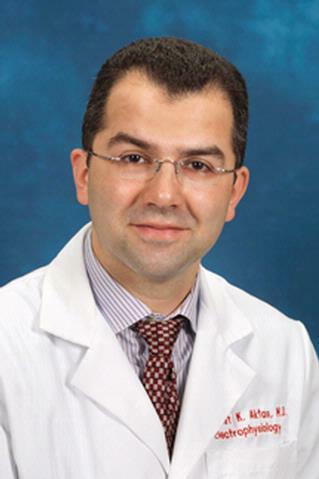 Dr. Aktas is a member of the electrophysiology section, and he takes care of patients with arrhythmias. Specific areas of expertise include ablation of atrial fibrillation, supraventricular tachycardias (SVT), and ventricular tachycardia. Dr. Aktas is an expert in complete management of pacemakers, defibrillators, and resynchronization devices. He is board certified in Internal Medicine, Cardiovascular Disease and Clinical Cardiac Electrophysiology. Dr. Aktas earned his M.D. from the State University of New York Upstate Medical University in 2002. He was a medical resident at the Cleveland Clinic, and trained as a cardiology fellow and electrophysiology fellow at the University of Rochester Medical Center. He joined the faculty at the University of Rochester Medical Center in 2009. Linte CA, Camp JJ, Rettmann ME, Haemmerich D, Aktas MK, Huang DT, Packer DL, Holmes DR. "Lesion modeling, characterization, and visualization for image-guided cardiac ablation therapy monitoring." Journal of medical imaging.. 2018 Apr 0; 5(2):021218. Epub 2018 Mar 01.